This piece was drawn specifically for the Candida Stevens ‘Good Nature’ Exhibition in September 2017. 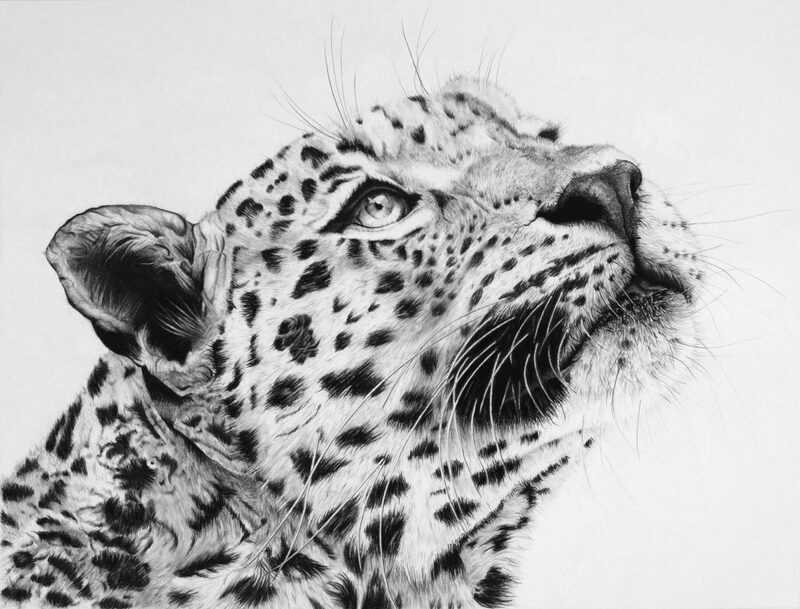 The drawing was inspired by my time in India when I was lucky enough to see this beautiful leopard in the wild. The markings on this particular leopard identify a female affectionately named Nagini by the locals. Her story is one of survival under tremendous challenges. She was believed dead after her mother’s untimely demise when she was a young cub, however she was spotted many months later, healthy and hunting peahens in the area where she grew up. Her remarkable resilience has meant that she has grown into adulthood and now breeding in the area. Inside the piece, I have embedded amongst the Nagini’s spots the silhouette of a traditional Rabari herdsman with his distinctive turban to reflect the ancient and balanced relationship between man and leopard. This piece comes with thanks and appreciation to the incredible work of SUJÁN’s JAWAI, who offer responsible tourism within this magical landscape. They work tirelessly with the government to conserve and support the local community providing employment and adopting schools.